In The Final Mission of Extortion 17, Ed Darack details the 2011 shootdown of a U.S. helicopter in Afghanistan. After 16 years in Afghanistan, the United States shows little sign of finding a way out of the war. The administration of U.S. President Donald Trump recently announced its Afghanistan strategy, avoiding putting a number on expected troop increases but promising to refocus the mission on counterterrorism. One thing can be assured: more Americans will inevitably die on Afghan soil. In a new book — The Final Mission of Extortion 17 — published by Smithsonian Books, journalist and photographer Ed Darack revisits the shootdown of Extortion 17, a Chinook bearing U.S. and Afghan troops, in 2011. The tragedy, in which all 38 people aboard the helicopter were killed, is considered the worst loss of American lives, in a single incident, in the ongoing war. The Diplomat interviewed Darack about Extortion 17, the war in Afghanistan and the impact of such tragedies on the civilian-military divide. 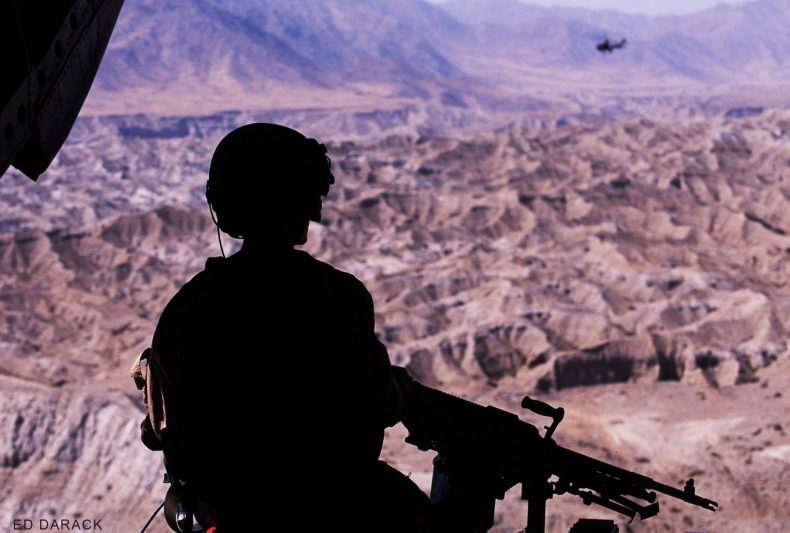 Silhouette of a flight engineer, one of the crew members of a CH-47D Chinook, manning an M240 machine gun on the loading ramp with badlands formations of eastern Afghanistan in the background. The CH-47D Chinook is defended by three M240 machine guns, one on each side and one on the rear loading ramp. Photograph copyright Ed Darack. For our readers who may be unfamiliar with Extortion 17, can you describe what happened on August 6, 2011? Early in the moonless, pitch-black hours of August 6, 2011, a U.S. Army CH-47D Chinook, call sign “Extortion 17” (pronounced “one seven”) entered the western opening of eastern Afghanistan’s Tangi Valley, which lies roughly 40 miles southwest of Kabul. On board were two pilots, three crewmen, and a strike force built around members of SEAL Team 6. They were en-route to bolster an American-led special operations ground operation that required more troops. As they flew past a small village at the narrowest point in the valley, two enemy fighters — completely unknown to American or coalition forces — who happened to be at the right place at an opportune time and heard the approaching helicopter, shot down the helicopter with rocket-propelled grenades. Many enemy fighters in Afghanistan at that time attempted shootdowns, but only a small handful had ever inflicted any damage. This would be one of those rare, tragic moments. One of three rocket-propelled grenades struck one of the blades of the aft rotor assembly of the tandem rotor helicopter, severing more than ten feet of it. The catastrophic imbalance caused extreme gyroscopic forces to rip the helicopter apart and kill all onboard within a fraction of a second. Extortion 17 plummeted to the floor of the Tangi Valley and erupted in a fireball that could be seen tens of miles away. All 38 people on board died — thirty Americans and eight Afghans. Additionally, one American military working dog perished. This was the greatest single incident loss of life in the history of the U.S. war in Afghanistan, in the history of U.S. Special Operations, in the history of the Navy SEALs, and the history of SEAL Team Six. 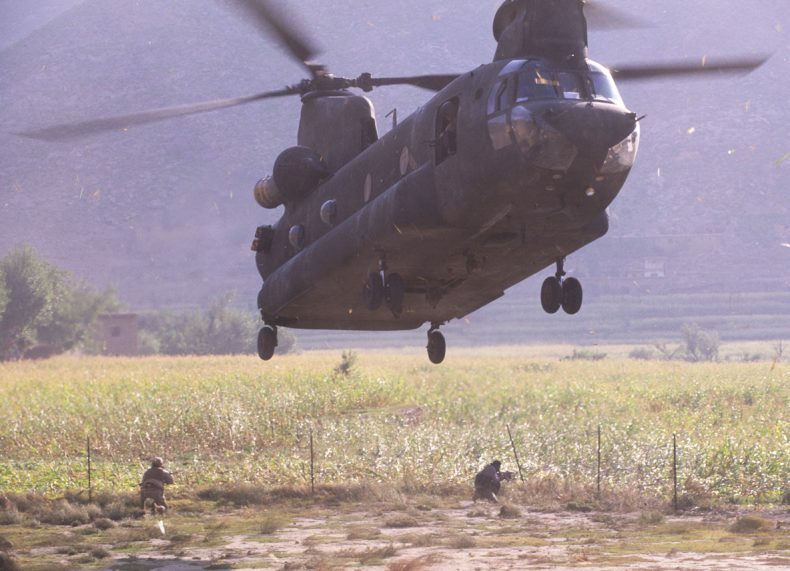 A CH-47D Chinook lands at a small, unimproved landing zone in Afghanistan’s eastern Kunar Province, a few miles from the border with Pakistan, to begin a combat operation. While the fastest helicopter in the U.S. military, and one of the most powerful in the world, the Chinook is capable of landing and launching from small “postage stamp” landing zones of all types and conditions. Extortion 17 was en route to a similar landing zone just prior to being shot down. Photograph copyright Ed Darack. What was media coverage of the incident like in the immediate aftermath? Like many wartime tragedies, the coverage was spotty at first and then hard facts began to emerge. However, the vast majority of the coverage of the event since it happened — even years after the tragedy — was peppered with inaccuracies, omissions, and in some cases nonsensical conspiracy theories. Until the publication of The Final Mission of Extortion 17, the full story has never been told — not even close. The book goes into great detail on the people of the tragedy, the helicopter, the mission, the aftermath, and the hunting and striking back at those responsible for the shootdown, this last part being an aspect of the story that has never been told with any detail at all, until now. In the six years since the downing of Extortion 17, there have been several conspiracy theories about the incident. Why was it important to revisit the case of Extortion 17 and outline a comprehensive narrative of what happened? Providing an in-depth, comprehensive account of the story of Extortion 17 is very important for a number of reasons. This was a historically very significant event, one that left the general public with a number of questions that were only partially answered, if answered at all. 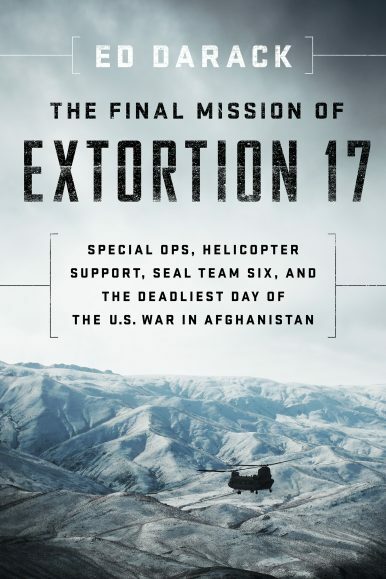 The Final Mission of Extortion 17 comprehensively tells the full, in-depth story, and answers any and all questions anyone may have about the incident. This full-spectrum narrative also puts to rest any and all of the ridiculous conspiracy theories. A U.S. Marine lies behind a machine gun during a combat operation in Afghanistan’s eastern Kunar Province, just a few miles from the border with Pakistan. This operation was only possible due to the power, speed, and nimbleness of the two CH-47D Chinooks (in background, being offloaded of supplies) that transported ground troops and gear. 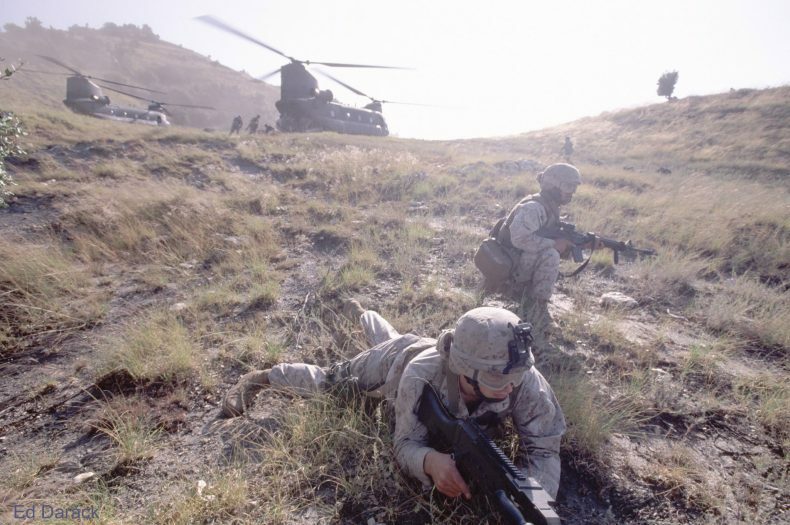 The pilots landed side-by-side to begin this operation, just as the pilots and crew did with Extortion 17 to begin the combat operation on the ground in the Tangi Valley. Photograph copyright Ed Darack. In the 16 years the U.S. has been involved in Afghanistan there have been just over 2,400 U.S. service members killed, often in ones, twos, threes. Do you think this has impacted how the war is viewed by the American public? Was the incredible loss of life from the downing of Extortion 17 perceived differently? I think that each and every life lost makes an impact, and that the sheer volume involved in the Extortion 17 tragedy certainly made a widespread impact simply in the attention it drew to the inherent dangers that war fighters face on a day-to-day basis. Recently, U.S. President Donald Trump announced his administration’s new Afghanistan strategy. Though he did not state specific numbers, it appears that an increase in troop levels is in the cards, and likely more offensive counterterrorism missions on the part of U.S. forces in the country. Does the case of Extortion 17 hold any lessons for policymakers as they contemplate a sustained, and perhaps increased, U.S. mission in Afghanistan? As I discuss in the book, and illustrate throughout its narrative, chance will always be part of war. A chance, or “lucky” shot brought down Extortion 17, and nothing can prevent such enemy serendipity. The U.S. military, however, continues to hone and refine not only its war fighting potency, but its survivability capabilities, and incidents like the tragedy of Extortion 17 certainly punctuate the importance of such efforts. 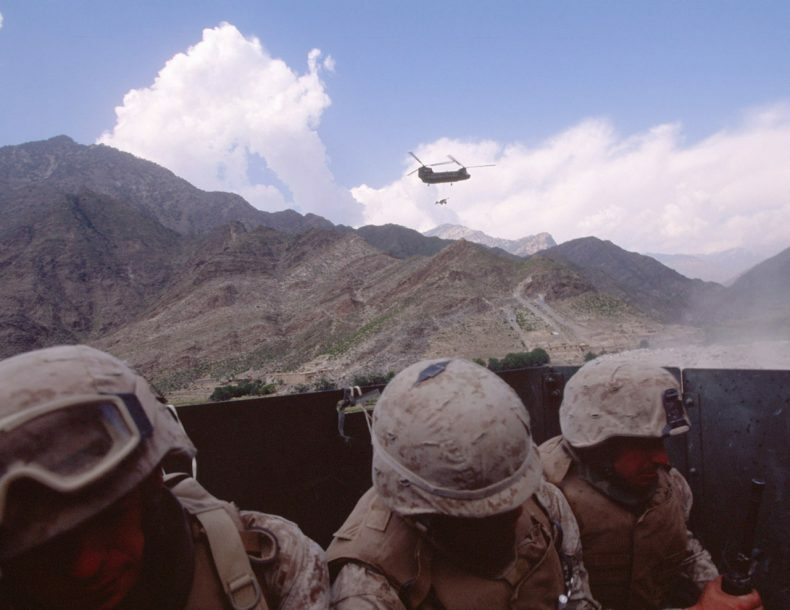 U.S. Marines in the back of a Humvee during a combat operation in Afghanistan’s eastern Kunar Province with a CH-47D Chinook “sling loading” an artillery piece in the distance. The Chinook is an incredibly powerful aircraft capable of lifting all types of cargo, including sling loads such as this one. Photograph copyright Ed Darack. In the book you bring the individuals involved to the forefront — we get to know them through the recollections of their fellow service members and their families. Given that there is always discussion about a growing civilian-military divide — especially in light of the “forgotten” Afghanistan war — do you think a book like this can help bridge that gap? That is a great question! In more than ten years of covering both wars [Iraq and Afghanistan], embedding with troops four times in Afghanistan, twice in Iraq, and dozens of times during training, one of the key issues I discovered is the rift between the realities of war and the perceptions of the general public back home. I found portrayals of war in movies, books, television, radio — all media — more often than not to be far different than what I experienced first hand, in virtually all aspects. One of my goals with The Final Mission of Extortion 17 was to bring what I call “the full spectrum experience of war” to readers of all walks of life. There is so much to the Extortion 17 story, from the perspectives of family members to how analysts gather intelligence for modern special operations missions. I weaved all of these components together into the greater Extortion 17 narrative. I really believe that through this tragedy we can all glean a comprehensive understanding not only of the Extortion 17 story, but of the greater experience of war, as well. I think that everyone interested in war should read this book to see how the incidents, and hence the myriad “stories behind the story,” provide a lucid window of understanding of this incredibly important topic to those who have never experienced war first hand.